If a client is considering hiring a freelancer on odesk, the first place they are going to look for information is their odesk profile. This applies to when you apply for a job or when a client is looking for freelancers to hire. Always ensure your profile is as resistible as possible. It is not only final to have a resistible profile, it must be up to date. Take new tests and add to it, adjust your hourly rate with new experiences, put new portfolio project, get better feedback displayed on it or add certifications. All these will keep your profile up to date and attract new employers, as it also increases your ranking on the odesk search engine. Your profile is your chance to showcase your work. Take advantage of it. SEE ALSO : Tips and Tricks for Creating an Irresistible Odesk Profile. Once you identify a job of your interest, take time to understand the clients’ needs and come up with a killer resume. Do not use one cover letter for more than one job aka NEVER USE GENERIC / RECYCLED COVER LETTERS. BONUS: How to write a killer cover letter . Ensure every cover letter is unique to the job advertised because most employers will recognize and know if you missed any information highlighted on the job listing. Some jobs have specific instructions and you must watch out for these. Follow the directives and if unsure, ask to get clarification. iii) Keep Bidding, Keep Bidding, Keep Bidding !!! It goes without saying that you keep breathing to stay alive. On oDesk it is not different, a freelancer keeps applying for jobs that suit their skills and profession to get the jobs. Like it or not competition is everywhere. In the spirit of freelancing, competition is a good thing. In the spirit of a competitor (freelancer) eating your lunch, it’s not so good. If the latter is the case, you must research your competition. Look up freelancers with similar skills and experiences as you, who seem to be acing interviews and getting all jobs. Strive at having similar or better profiles as theirs, include updated and applicable portfolio projects, take relevant tests and compare their hourly rate with yours. 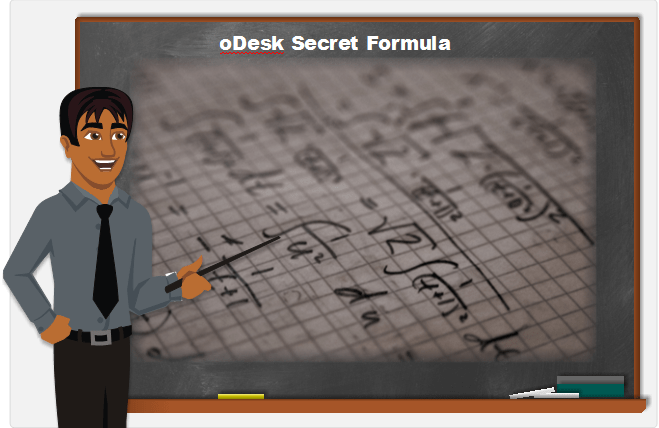 I have used the odesk secret formula for the past 3 years and it is no reason I have landed over 99 contracts and over 1500 work hours. Now it us up to you to try out the formula and if it works out to your advantage please leave a comment in the box below. If it doesn’t also work feel free to comment with your concern. You can also contact me or get me on Facebook. Hey, thanks for sharing valuable information, i am very new to odesk and wondering how to get my first job. Thank you for taking you time to read my blog. Highly appreciated. It is both easy and hard to get hired as a newbie on odesk but with the right skills you can get hired within no time. In the meantime you can check out some of the jobs that anyone new on odesk can apply to. Thanks Charles. Your comments are highly appreciated.